Blazer: £159, And Other Stories (sold out in this colourway but navy is still available here). Jumper: Arket (old but do check out their knitwear selection as it is superb). Trousers: Cos (old but they always do similar version, these here are very similar). Bag: Sandro (old). Shoes: LK Bennett (old). Photographs: Eva K Salvi. (I have worked with Arket, And Other Stories and LK Bennett within the last year but this post isn’t sponsored in any form). I haven’t actually done a bog standard outfit post in a while. The truth is that I have stopped buying as much. I am trying my hardest to buy well thought out, longer lasting pieces, that’s not to say anything I bought before wasn’t right – I still own it, but I no longer need a pink sequin skirt as I have one which makes me smile, and I’m now thinking about the longer, bigger plan. 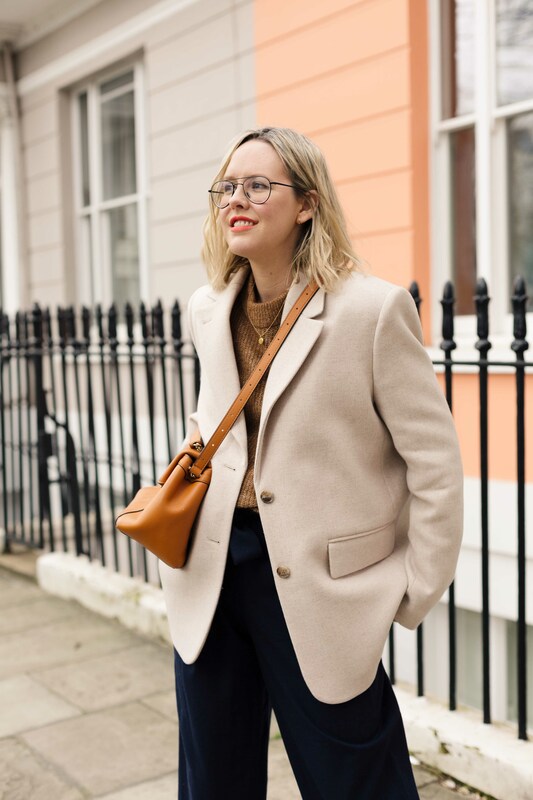 In the past, I probably have got caught up in the whole buy, buy, buy mentality, and as someone whose job is essentially to ‘test’ trends and edit the High Street it can become hard to know where to stop. So please know that even if I sometimes have a lot of clothes, it is in no way a reflection of what ‘everyone’ should have or something people feel they need to keep up with. With that said, I am doing less outfit posts in general, less shopping stories and more just showing nice outfits I have put together of things I love with existing pieces from my wardrobe. Hopefully providing some useful styling tips along the way. Currently, I’m wearing a lot of the Scandi brands: Arket, Cos and And Other Stories in particular have my heart right now and the kind of ethos I am into. I am looking forward to seeing the Everlane store when we go to New York next month, and generally, I feel I have finetuned my shopping experience into buying less but better. 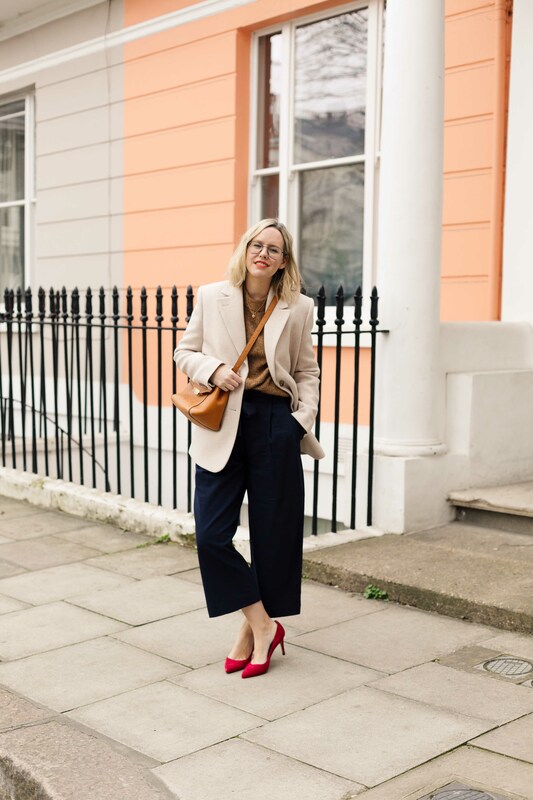 I am so in my comfort zone here: a blazer has been a key piece for me since I started working in magazines, I was always a fan of pairing with jeans and a loose tee, the closest I ever got to nailing that awkward ‘smart/casual’ dresscode. I should probably mention this blazer is supposed to be oversized (I’m wearing a size 10). And I personally love that about it. It’s the new way to wear tailoring and, if you’re bold, cinch it in with a waisted belt. But for me, now, I’ll just keep it simple with some tailored trousers. 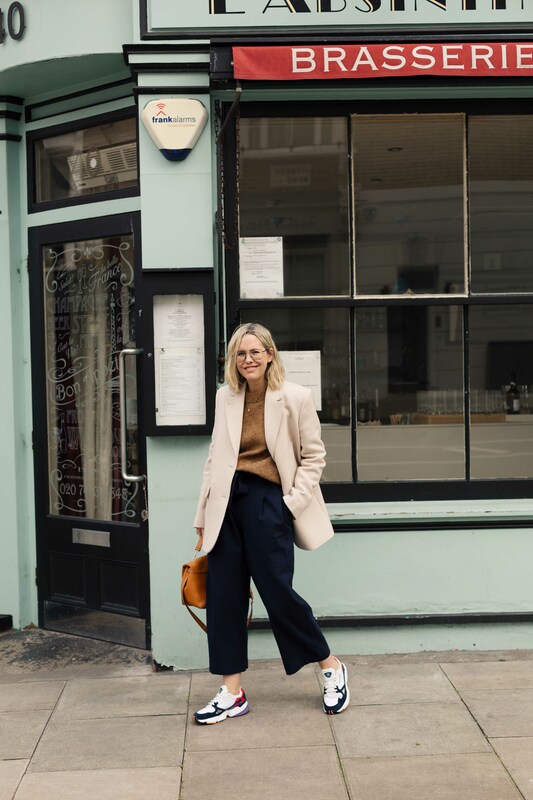 I am such a ‘denim by default’ person and often forget I can wear different trouser shapes – when I had Peggy I had to say goodbye to a lot of my jeans due to my changing body shape, so I invested in a few well-cut pair of trousers in my new size. It felt liberating not being reminded of my unzippable pairs of jeans hanging in my closet and now I only reach for pairs that make me feel good yet comfortable. 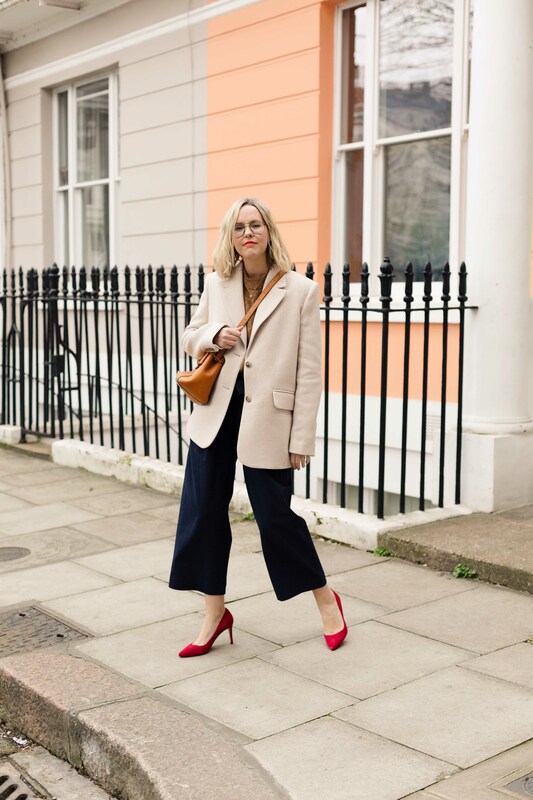 I have only ever really owned a few pairs of trousers, and they have mostly been from Cos – I just find the fit and quality to be right for me. The idea behind this outfit post was how I generally dress for different occasions – I don’t. Usually, if I’m in town and have a work event (note: it’s rarely seeing friends or going ‘out out’ in my evenings – most of the time sadly, it’s work events that fill my nights, and I see friends on weekends) I am that person who carries heels in her bag, but I will mainly keep the outfit the same. For me, it’s important to have a wardrobe that’s versatile – I wear the same thing to a meeting as I would to see friends, hang out with Peggy, or go to dinner. I don’t have a work/weekend wardrobe really (although I do have a drawer of favourite joggers that I love to wear around the house). Blazer: £159, And Other Stories (sold out in this colourway but navy is still available here). Jumper: Arket (old but do check out their knitwear selection as it is superb). Trousers: Cos (old but they always do similar version, these here are very similar). Bag: Sandro (old). Trainers: £85, Adidas. Mostly, I will wear trainers for meetings, I am always swiftly walking and getting the tube for meetings, I am too impatient to wear heels. And I am lucky enough that footwear isn’t an issue for most of my work (unless it’s dinner at Annabel’s! But I have only been fortunate to be invited there once, and was made to change my shoes before entering – thank goodness for my bag of heels!). I love how just one shoe change can have such an impact on an outfit – sometimes it really is just about changing your mindset to dressing. 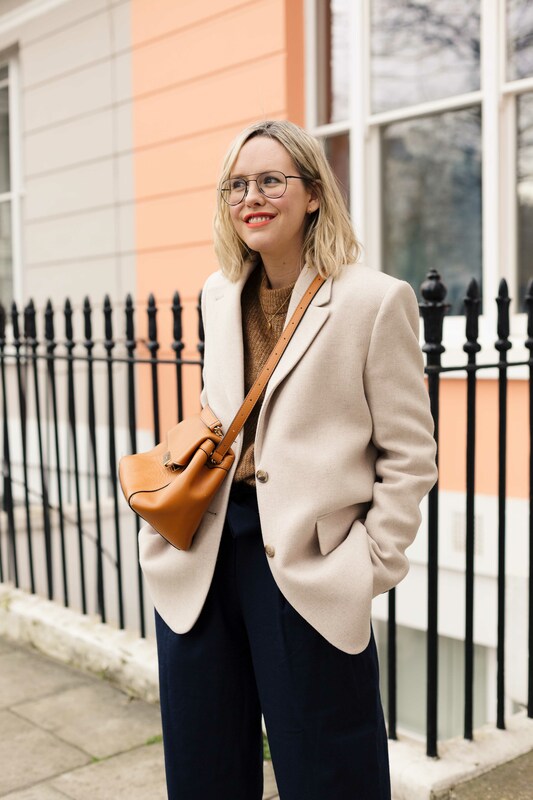 Most outfits in our wardrobes can be adapted by changing just a bag, a bright lip colour, a different pair of shoes – and that’s far easier to carry around than a new outfit! Really enjoyed your post, as ever! I like the way the clothes choice in the photos reflect your txt ie all from your own wardrobe but with links to current stock. Al tho most people now flag up sponsored post, I do find them a turn off and personslly I like a non sponsored real deal post like yours today, many thanks! I have to admit that I also prefer versatile pieces in my closet since I love to pair them which each other, add some accessories and get totally different looks. The jacket in beige /camel colour is exactly the thing I’m talking about. I can feel its quality even through the screen. Very comfortable yet smart and versatile piece. Alex, as ever you look like the epitome of relaxed style. I adore this outfit and your comments on having enough are inspiring. I guess we all buy too many clothes because we get bored with the ones we have but it makes sense to buy less, make it work harder and be more imaginative with accessories to change the look. I never wore trousers until I was pregnant with my third child but now I gravitate towards them after discovering a jersey pair (non maternity but with a ribbed waist) in an independent boutique. While I’ve nothing against a sponsered post (you have to make a living after all), I appreciate a post that helps and encourages us to use what we already have – that’s the reality for most of us! I quite often find that I can shop my wardrobe when I’m inspired by a post like this, tweaking it to make it mine! 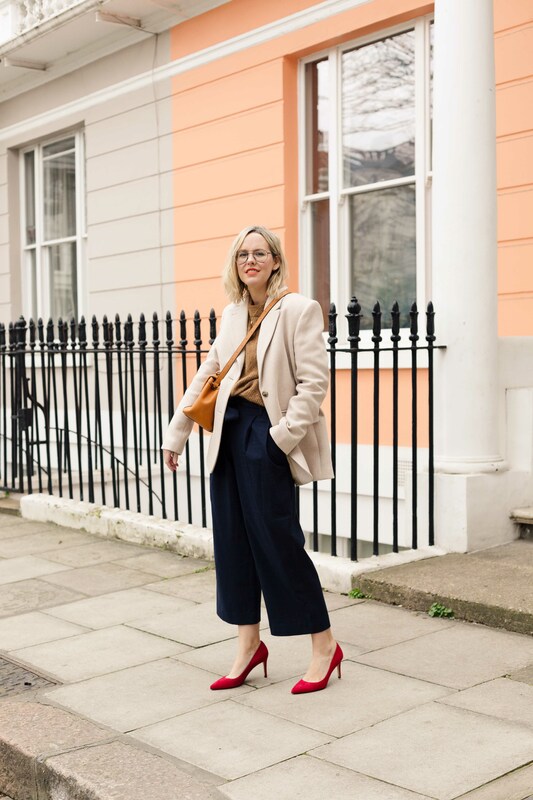 This outfit is one of those – blue blazer (not oversized, as it’d swamp my petite frame), any number of sweaters, navy wide leg trousers, blue suede heels or blue/grey stan smiths, and a navy bag (yes blue is my favourite colour!) As you say, it’s amazing what a pair of shoes can do for an outfit! I’ve followed your socials for quite a while now, and I admire the way you’re not afraid to buck the trend. I love that you’re not afraid to take a break from it all, your stance on ‘environmentally friendly’ products, and I’m loving this buying less blog. As Instagram and friends have got very ‘samey’ and a bit ‘bleurgh’ lately, (I’ve deleted loads, seeing the same all the time), yours stands out and is informative, honest and still a joy to read. Hi Alex, great read as usual. When in NY, if you’ve not already discovered these places do check out Flute champagne bar (honestly not too pricey or pretentious, just nice – and go for the flight) and Eataly, a market inspired Italian with wine bars, pizza, pasta, standing, bread, olives etc. all under one roof. Enjoy! I think dressing in a more considered way comes with age and knowing what suits you and makes you feel good. Wanting quality over quantity and having other things to spend your money on like children and homes. Good quality pieces continue to look good for so much longer than disposable fashion too.